Online ordering menu for Kol's Pizzeria & Roast Beef. 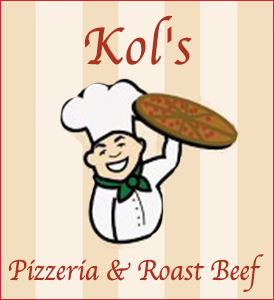 Welcome to Kol's Pizzeria & Roast Beef in Malden! Locally owned and operated, our family- friendly Italian restaurant is open all week long! Stop by and treat the family to a unique selection of Italian cuisine, fresh seafood, and American favorites including our Italian Special Supreme and Hawaiian gourmet pizzas! We also have amazing pasta and calzone options you'll definitely want to try! Find us near the intersection of Broadway and Elwell, right next to the Town Line Luxury Lanes. Order online for carryout or delivery today!